Item number Nd589 a-b from the MOA: University of British Columbia. 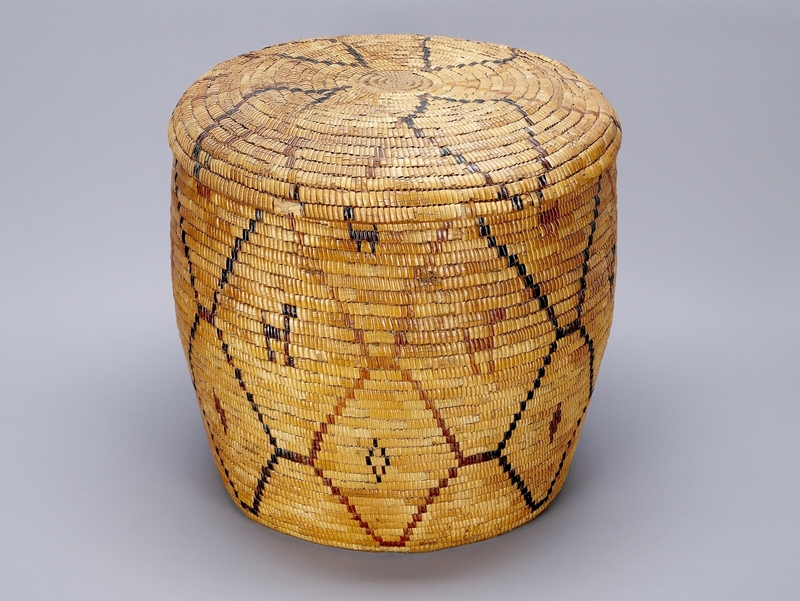 Coiled, cylindrical cedar basket (a) with lid (b). Imbricated with light yellow grass and wild cherry bark. Slat bottom. Watch-spring coiled lid; one leather tie on outer edge of lid with geometric and representational designs over basket body; net of diamond shapes with animal figures inside. Lid has floral pattern radiating from centre. A gradual change occurred in Salish basketry from the 1820's to the 1940's with the decline of utilitarian basket making and the increase in decorated baskets, made for sale. Beading and imbrications are used individually and jointly as a means of ornamenting coiled basketry. When finished, ordinary beading looks like a ribbon drawn along the coil after it has been sewn over and under the stitches. A line of imbricated stitches has the appearance of a row of tiny overlapping shingles, only the edges lie vertically, not horizontally.